My neighbor has the most gorgeous clematis vine growing in a partly shaded area. It has huge blue flowers and I believe she called it Mrs. Chumly? Anyway, I would like to try my hand at growing a clematis vine myself, either the same variety or another that would tolerate part/dappled shade. How many vines would I need to purchase? Will one vine branch out enough to look full? Can I mix the varieties as long as they have similar pruning needs? What is the best way to support the vine? How do you prune a vine that has grown very tall? What is the best time to plant one? Sorry about all of the questions! There is so much conflicting info on the web that it was making my head spin. I'm hoping someone here has experience with clematis and can help... thanks! as many as you wish. yes. yes. on a trellis, a fence or a handrail (unless it's the ground-cover variety; then you don't need anything). spring to early summer. here's some info about the mrs. cholmondeley variety. lots of good info on that site (that's the .org site). there's also the .com site. good info there, as well. they don't list as many varieties tho. I am not surprised that you have several clematis! What don't you have? Thank you for the links... lots of great information. I'm glad to hear I still have time to plant one or two or three. Are your vines growing together or separately? Is there anything special to keep in mind while looking for a trellis? Your garden must be fabulous. Have any pictures for a newbie to drool over? Joanne-Clematis is pretty much easy to grow but I find-I have the Jackamani variety and one of something else that they do the best in full sun or southern exposure.I had one before in a northern exposure and I just couldn't get it to thrive the way the spouthern exposure one did.They will climb on a trellis or support but need something about 2 ft. wide as the bigger they get -the wider they spread too.There are also some new ones out that are pink and burgundy too.Plant some now.Good luck to you! Joanne, I've found that Clematis are extremely easy grow if you keep their feet in the shade and their head in the sun. They don't like the hot summer sun bearing down on their roots. 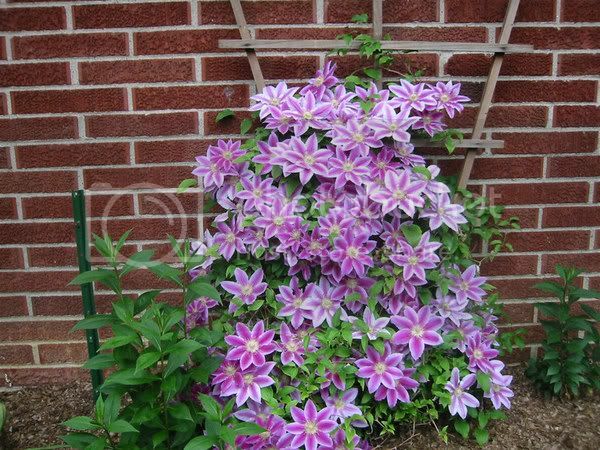 You could put some mulch or light colored gravel (to reflect the sun's rays) around the base of the Clematis or even plant some annuals around it. I have mulch around my mine. When you buy Clematis make sure you know which group they belong to so you will know when and how to prune them. Here is a picture of one of my Clematis. What beautiful flowers Patches! What type of clematis are they? I called my neighbor last night to ask about her vine and she told me it gets partial shade. She says mrs. cholmondeley is the best shade tolerant clematis and she has been growing it now for 4 or 5 years. The area I want to plant in is an east facing wall that gets 4 to 5 hours of morning/afternoon sun a day. Is this enough sun for any clematis or should I stick with a shade tolerant one? I'm still trying to get a grip on what areas of my property are full sun, part shade and full shade. The definition seems to be different depending on who you talk to. I hope my local nurseries carry a variety although I have yet to see a clematis I didn't love. I love the clemantis too. I have a beauty, and have been thinking about planting another beside it to use same large trellis, is this advisable, I have a tiny yard and am quickly filling it with everything I love. I just tracked the amount of time the east wall gets sun and it was only 3 hours. The trees have filled in around the property and block the sun until about 10am. Is this enough sun for a clematis or should I find a different spot? patches, that is a TERRIFIC vine!! that's a nelly moser, right? what direction is it in? mine doesn't look nearly as nice. i haven't pruned it as i should have tho...will start doing it properly this year. i also may not have it in a good spot sunwise. the combo of the .com site and the .org site provide all the info needed to care for clematis properly - from basic variety info; to zone tolerance; to sun requirements; to pruning needs. so, i've learned a lot about them recently (just found the sites a couple months back). lake, you can certainly plant a different variety on the other side of the trellis!! in fact, that will look very nice in a few years when they become intertwined and you have to two different types of flowers blooming next to each other! make sure the second one blooms at the same time as the one you already have! anything that is viny (there ARE other things besides clematis!!) is good for small areas - while going outward may be restricted going upward usually isn't! my front yard is extremely small. my backyard isn't too large either - very long and very narrow (i live in a twin). i'm making the most of the space tho!! Patches - that is GORGEOUS!!!! I just pulled out a VERY invasive vine and was looking for something a bit tamer to take its place...that looks PERFECT! some don't need all that much sun and other most definitely need to be in sun all the time. Patches thanks for sharing, hope my clematis does better this year. I think I planted it in soil that was too much like clay and now it's having a hard time doing what it's supposed to do. This year there are 3 shots coming up, so I'm hoping. Darn, I knew someone was going to ask me that and I really don't know. It was the first one I ever bought one and I wasn't concerned about knowing the name at that time. Sorry! I have this one planted where it gets full sun. Maybe someone else knows what kind it is! Thanks joclyn! I'm really glad to know that so I can look it up and find out more about it. sue, which variety do you have? different ones have different pruning requirements (as well as sun/shade needs). they also sometimes get clematis wilt. what part of pa are you in? if you're near me, then i wouldn't worry about the wilting too much. mine jackmanii is a bit droopy - the weather has been so funky! if you're that concerned about it, trim back that one piece - go an extra inch or two back from where the wilting starts. Definitely nelly moser Patches. I have that one also. It's only two years old and doesn't look half as good as yours. Thanks for the info. Yes I am learning to go up up up. Morning glory up the second floor deck posts. beans on the deck rail Hanging baskets. Can you tell I am very excited about this new obsession? I'm just around the corner in York. I would love to know if there are any nurseries that you recommend. I'm new to the gardening obsession and still haven't let myself loose on a nursery. I suspect I would come back out with half the store. Glad to meet you! The one I use is clematis.com. They have some wonderful information there. I think you'll enjoy it. I found Clematis On The Web to be very helpful as well. I've become quite addicted to clematis this year and now have 13 plants. 5 were not tagged so I'll be suprised next year when they bloom.